Black and white negative of a photograph of a postcard depicting Whitby Collegiate Institute. There is a group of students standing against the wall of the school. 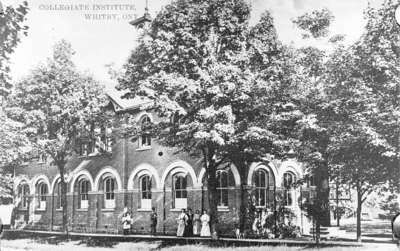 The Whitby Collegiate Institute was built in 1873 and was located on the south side of Colborne Street between King and Centre Streets. The school was demolished in 1975-1976. Whitby Collegiate Institute, c.1910, George I. Wilson, Whitby Archives, 10-001-016.